As of mid-2017, regulators in 42 countries have advanced plans for 5G spectrum by conducting auctions, designating certain bands, holding consultations, or announced plans to auction frequencies or have already allocated spectrum for 5G use, according to GSA. This in-depth report provides a country-by-country overview of 5G spectrum. In Europe, Ireland, Latvia, Spain and UK have already completed auctions of 5G spectrum. Germany, Greece, Norway having recently completed auctions of spectrum that could potentially be used for 5G. Ten countries are known to have confirmed 5G spectrum auctions between 2018 and 2020 including Austria, Finland, France, Germany, Greece, Italy, Netherlands, Romania, Sweden, Switzerland. Three countries planning auctions of potentially suitable bands -- Norway, Slovakia and Switzerland. In AsiaPac, Australia, China, Hong Kong, Malaysia, Japan, and South Korea have 5G auctions/allocations confirmed. In June 2018 Korea completed a 5G auction for spectrum in the 3.42–3.7 GHz and 26.5–28.9 GHz frequency bands. Taiwan, New Zealand and Singapore have initiated consultations to consider both mid-band and mmWave bands. TSMC was disrupted by a computer virus outbreak on the evening of August 3 that affected a number of computer systems and fab tools in Taiwan. As of Sunday at 14:00 Taiwan time, TSMC stated that about 80% of its impacted tools have been recovered, and the company expects full recovery on August 6. "We estimate the impact to third quarter revenue to be about three percent, and impact to gross margin to be about one percentage point. The Company is confident shipments delayed in third quarter will be recovered in the fourth quarter 2018, and maintains its forecast of high single-digit revenue growth for 2018 in U.S. dollars given on July 19, 2018." TSMC also noted that data integrity and confidential information was not compromised. The International Telecommunication Union (ITU) has established a new Focus Group on Technologies for Network 2030 with the aim of identifying emerging and future technologies beyond 5G. Possible post 5G use cases include new media such as hologrammes, a new generation of augmented and virtual reality applications, and high-precision communications for 'tactile' and 'haptic' applications in need of processing a very high volume of data in near real-time – extremely high throughput and low latency. As a standards organization, MEF is dealing with this change in a couple of ways. 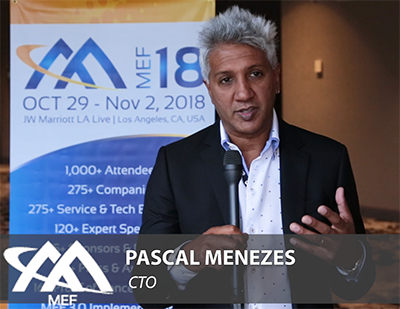 Rather than write the specification first, MEF is looking to developers to iterate their software first and then following with the specification development. Filmed at the MEF Annual Members' Meeting in Nashville. 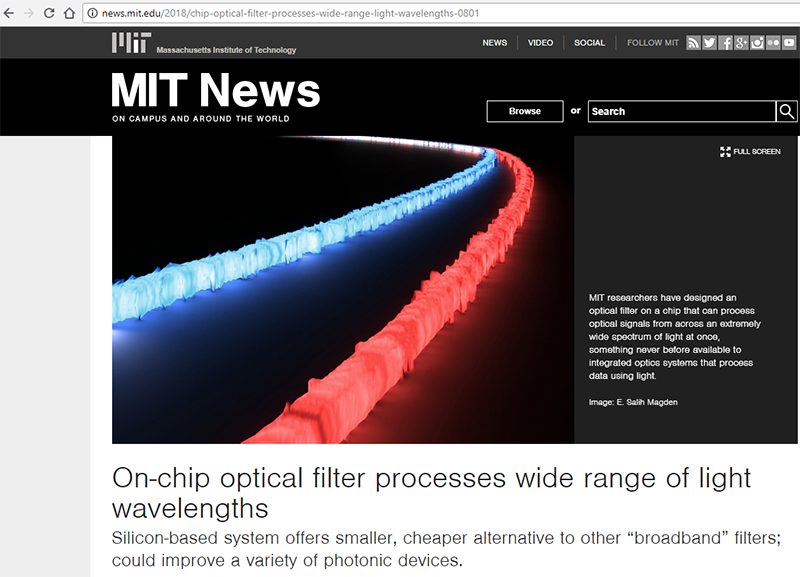 Researchers from MIT’s Research Laboratory of Electronic have designed an optical filter on a chip that can process optical signals from across an extremely wide spectrum of light at once. “This new filter takes an extremely broad range of wavelengths within its bandwidth as input and efficiently separates it into two output signals, regardless of exactly how wide or at what wavelength the input is. That capability didn’t before in integrated optics,” says Emir Salih Magden, a former PhD student in MIT’s Department of Electrical Engineering and Computer Science (EECS) and first author on a paper describing the filters published today in Nature Communications. Potential applications include fiber-to-the-home installations.